MORE HITLER PAGES: Additional Perspectives, Another Theory, Contradictions, Did Hitler Escape The Bunker?, Hitler's Body, Was Hitler's Body Ever Found, Visitor Thoughts, and OUR CONCLUSION. MORE: "The Last Days of Adolf Hitler," by Anton Joachimsthaler, translated by Helmet Bogler, Arms & Armour Press (1996); "The Murder of Adolf Hitler, by Hugh Thomas, St. Martin's Press (1995). Since his supposed death on April 30, 1945, many trees have fallen to create articles and books concerning: is Hitler dead; how did he die; is he alive, and so on. 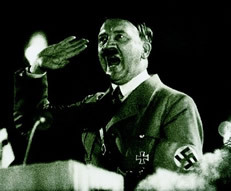 Although he would be EXTREMELY old if still alive today, hiding in a well guarded mansion in Argentina, enough lies and contradictions have been put forth concerning the death of Hitler and Eva Braun, and the disposal of their bodies, that speculation about how and if Hitler died persist to this day. Hitler, by Hugh Thomas, St. Martin's Press (1995).